Price: £0.92 (incl VAT) Sorry, this item is currently unavailable. Click here to receive notification when this product comes back into stock. 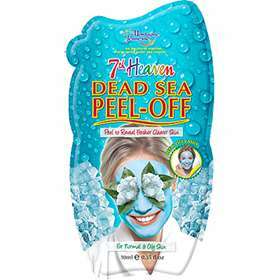 Montagne Jeunesse 7th Heaven Dead Sea Peel-Off Mask cleans and purifies your skin. Chamomile soothes your skin and Fucus Vesiculosus fights free radicals. The cleansing and nourishing magic of this face mask will leave your skin feeling healthy and revitalised. Peel to reveal fresher clearer skin. Avoid eyes, if contact does happen wash out with water. Aqua (Purified Water), Polyvinyl Alcohol, Alcohol Denat (Plant Origin), PPG-1-PEG-9 Lauryl Glycol Ether, PVP, Propanediol (Plant Origin), Undecyl Alcohol, Xanthan Gum (Natural Thickener), Propylene Gycol, Maris Sal (Dead Sea Salt), Laminaria Japorica (Seaweed) Extract, Fucus Vesiculosus (Seaweed) Extract, Tocopherol (Vitamin E), Anthemis Nobilis (Chamomile) Flower Extract, Vanilla Planifolia (Vanilla) Fruit Extract, Jasminum Officinale (Jasmine) Flower Extract, Aesculius Hippocastanum (Horsechestnut) Seed Extract, Potassium Sorbate, Sodium Benzoate, CI 19140 (Yellow 5), CI 42090 (Blue 1). Product code: 48955A Price: £0.92 (incl VAT) Sorry, this item is currently unavailable. Click here to receive notification when this product comes back into stock.